Two Nerdy History Girls: Ann Frankland Lewis & "The Dress of the Year"
Painting in watercolors was an "accomplishment" for many genteel ladies in the 18th-19th centuries, a pleasant way to pass the time and produce small artworks for the admiration of friends and family. Most of these have been lost over time, but a collection of at least one lady's work remains today in the Los Angeles County Museum of Art. 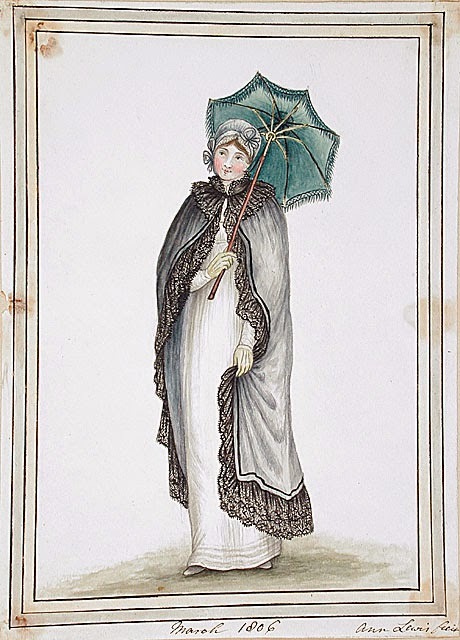 Using contemporary fashion plates as her inspiration, Ann Frankland Lewis (d. 1842) painted pictures of ladies wearing stylish dresses of the day. The paintings catalogue a wide variety of fashions and hairstyles as the wide hoops and towering "heads" of the 1770s gradually give way to the softer dresses with higher waists of the early 1800s. Shown here are only a few from the collection. As always, please click on the images to enlarge them. Little is known about Mrs. Lewis herself today, not even the year of her birth. She was the third daughter of Admiral Sir Thomas Frankland, Baronet, of Thirkleby Park, York. She married John Lewis in 1778, and after his death married the Rev. Robert Hare in 1811. She bore three children, including a son who achieved moderate fame as a Victorian parliamentarian, and she died in 1842. And that's it; like most women of her time, she's defined for posterity by the men in her life. Except that Ann left her watercolors. The earliest date from 1770, eight years before her first marriage, and she continued to paint for at least another thirty-five years after that. It's assumed she painted simply for her own amusement. Some of the earlier paintings are labeled "The Dress of the Year" in her neat penmanship, marked with the date. Again, no one knows if these dresses were ones she actually owned or wished she did, or were dresses she admired or imagined. What is certain, however, is that the paintings are charming, and reflect one lady's taste and style. Top left: Dress of the Year, 1778. 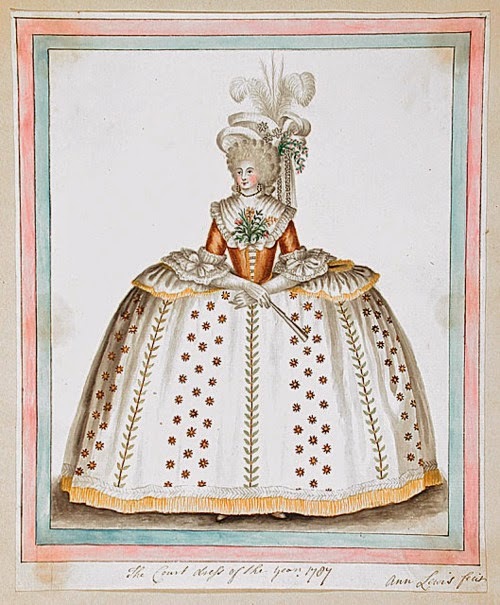 Top right: Court Dress of the Year, 1784. 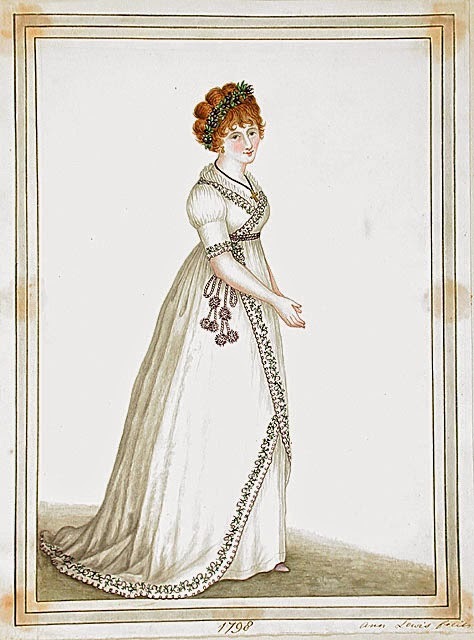 Lower right: Dress, March 1806. All watercolors by Ann Frankland Lewis, from the collection of Los Angeles County Museum of Art. What beautiful, delicate paintings! Did she do other types of painting, e.g. landscapes? 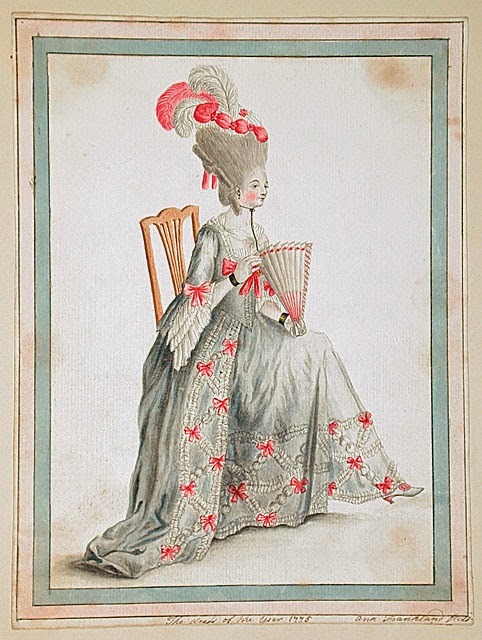 I imagine these were probably copied from printed sources -- fashion plates, something like that. This was a common activity for many women and men both in the US and abroad!